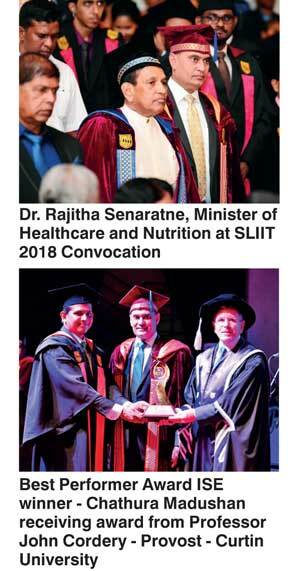 This year’s annual convocation held at the Malabe Campus of SLIIT, Sri Lanka’s premier higher education institute, to confer Bachelor’s and Master’s Degrees in Information Technology, Engineering, Quantity Surveying and Business Management was made more colourful by the presence of a galaxy of eminent Vice Chancellors and Heads of the Institute’s partner universities from overseas. The two-day convocation was held on 2 and 3 March in six majestic sessions with an eminent Chief Guest adding grandeur and grace to each segment with each delivering a Convocation Address. On the first day of the graduation ceremony, the Chief Guests who graced the occasion were Prof. John Cordery, Provost, representing the Vice Chancellor of Curtin University, Australia, Prof. Nigel Weatherill, Vice Chancellor of the Liverpool John Moores University, UK and Prof. Roger Eccleston, Pro Vice Chancellor of Sheffield Hallam University, UK. On the second day, the Chief Guests were Dr. Rajitha Senaratne, Minister of Healthcare and Nutrition, Dr. Mano Sekaram, CEO and Co-founder of 99X Technology and Dr. Tilak Siyambalapitiya, Founder of Resource Management Associates Ltd.
Students who excelled in academic and extracurricular activities were recognised with special awards. SLIIT Gold Medal for Academic Excellence in Bachelor of Business Administration Best Performance was presented to Dulara Sachinthana Athukorala and SLIIT Professor Lakshman Ratnayake Gold Medal and Best Performance Award winner was Sajana Sathsara Meddaduwage. Professor Lalith Gamage Gold Medal for the Most Outstanding SLIIT Graduate who also won the IFS Gold Medal for Academic Excellence and the Best Performance Award – Computer Systems and Networking (MIT) was clinched by Sivaguru Shasini Koshila Padmaseevili. The array of Best Performance Awards bestowed for diverse courses were generously sponsored by Dialog Axiata, Lankabell, MAGA Engineering, Walkers CML, Bank of Ceylon, Kent Engineering Ltd., Epic Lanka Ltd. and E-Wis Career Centre.